The important thing to remember with opt-in pages – that I see a lot of marketers forgetting – is that it needs to work well and look great on both widescreens and smartphones. Some headlines don’t look good on smartphones – so always test your optin pages on both widescreen and your own mobile phone. 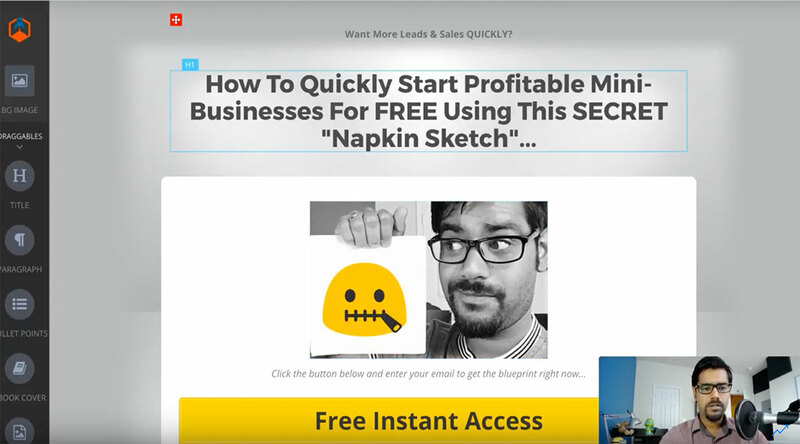 In today’s session (Day 6/30) – I took the napkin sketch creative and edited it quickly using my phone to create multiple sized creatives. Then I launched the Inbox Blueprint Launchpad software and went at it. I was able to easily create two different versions of the opt-in page. And it’s always important to create at least two versions. With the headline and a couple small elements modified. Just so that you can split-test. Creating two versions of the opt-in page. We used the same overall design structure. ALWAYS… ALWAYS write your copy first before starting the design process. It just seems to work really well for me. If you want to learn how to write better copy, check out Copywriting Academy. I am using the two-step optin page because I’ve seen it work better in some conditions. If this doesn’t play out well (read: convert) in the future, we will be modifying it up a bit. I’ve been secretly working on a completely “new style” of optin pages and I’ll reveal that in a few days. It’s completely untested and this challenge will make for a great platform to test that out. Tomorrow we will start working on the Thank You Page copy and design. Hopefully we can complete it all in tomorrow’s 15-minute sprint. I would love to hear what you thought of today’s session. Let me know in the comments below.